Roy Underhill The Woodwright's Apprentice: Twenty Favorite Projects From The Woodwright's Shop: Twenty Favorite Projects Fron "the Woodwright's Shop"
The Woodwright's Apprentice: Twenty Favorite Projects From The Woodwright's Shop: Twenty Favorite Projects Fron "the Woodwright's Shop"
For more than twenty years, Roy Underhill has taught the techniques of traditional woodcraft with muscle-powered tools. 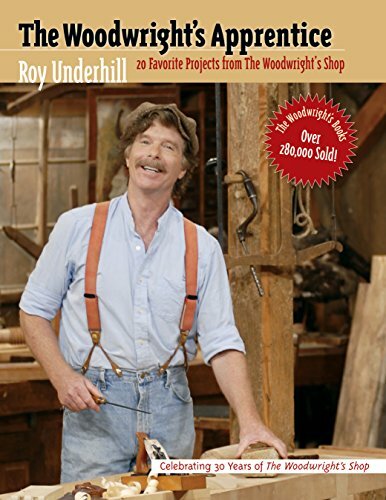 With his four previous books and his popular PBS series, The Woodwright's Shop, now in its sixteenth season, Roy has inspired millions to take up chisel and plane. The master woodwright returns here with instructions for handcrafting an appealing selection of projects from the American woodworking tradition. The Woodwright's Apprentice begins with directions for building a workbench. Each successive project builds new skills for the apprentice woodworker--from frame construction to dovetailing, turning, steam-bending, and carving. Among the twenty items featured are an African chair, a telescoping music stand, a walking-stick chair, a fireplace bellows, and a revolving Windsor chair. Designed both for woodworking novices and for more seasoned woodworkers looking for enjoyable projects, the book includes step-by-step directions, complete with easy-to-follow photographs and measured drawings, and an illustrated glossary of tools and terms. All of the pieces presented here are based on projects featured in past and upcoming seasons of The Woodwright's Shop television show. |Amidst the violent racism prevalent at the turn of the 20th century, African American cultural elites, struggling to articulate a positive black identity, developed a middle-class ideology of racial uplift. Insisting that they were truly representative of the race's potential, black elites espoused an ethos of self-help and service to the black masses and distinguished themselves from the black majority as agents of civilization; hence the phrase 'uplifting the race.' A central assumption of racial uplift ideology was that African Americans' material and moral progress would diminish white racism. But Kevin Gaines argues that, in its emphasis on class distinctions and patriarchal authority, racial uplift ideology was tied to pejorative notions of racial pathology and thus was limited as a force against white prejudice. The longtime master housewright at Colonial Williamsburg, Roy Underhill is the leading authority on old-time woodworking techniques. He created The Woodwright's Shop for public television in 1979. The series, produced by the University of North Carolina Center for Public Television, has aired nationally since 1981, with thirteen new programs introduced each year. Roy is a graduate of the University of North Carolina at Chapel Hill and holds a master's degree from Duke University.